Lindamente nomeado castelo com vista para o vale Casentino na Toscana, o lugar perfeito para explorar a paisagem toscana. O Castelo foi originalmente restaurado e decorado pelos donos do castelo, Flaminia Goretti de Flamini e George Specht, como o "sonho tornado realidade". Hoje, sua filha Martha mantém vivo este sonho, oferecendo a casa da família no castelo para alugar para os viajantes mais exigentes que procuram o incomum e inexplorado. Belas vistas, tranqüila, muito confortáveis, privados e relaxante. Sua chance de viver em um castelo medieval restaurada que, uma vez hospedado Dante e de dormir, onde Dante dormia! Esta jóia conjuga a singularidade de uma torre de menagem medieval decorado com obras de arte antigas e conforto moderno e está localizado nos pisos superiores da torre fortificada. É composto por uma ampla sala de estar e sala de jantar, com uma lareira antiga, sofás confortáveis ​​e uma mesa que acomoda 12 pessoas. No mesmo andar, uma cozinha totalmente equipada separado, com o costume de madeira feitos armários e feitas à mão cerâmica. Acima da sala de estar um mezanino oferece uma área de estúdio elegante com um sofá confortável e um pequeno lavabo. No piso superior, os quartos familiares, dois duplos e um single, decorados com belos objetos antigos, e duas casas de banho com banheira e chuveiro que estão decorados com a mão tradicional azulejos pintados. Os dois quartos de hóspedes, um duplo e um quarto twin, compartilham um grande terraço privado e uma casa de banho com banheira e chuveiro. Adjacente é uma zona de lavandaria totalmente equipada. No topo da torre, um terraço de tirar o fôlego, com vista para o Vale do Casentino e oferece um pôr do sol inesquecível. Para grupos maiores, o Castelo pode ser alugado junto com La Torretta, a antiga torre de guarda que voltou à vida como uma pequena casa de campo única. Colocado no perímetro das muralhas do castelo, o Torretta está localizado em frente ao castelo. Está em três andares ligados por escadas de madeira. No primeiro andar encontra-se uma kitchenette equipada com queimadores de gás, frigobar e microondas, etc. Uma máquina de lavar roupa está disponível para os hóspedes em outro prédio da propriedade. No segundo andar, uma pequena sala de estar com uma grande janela configurada como um recanto de leitura confortável. Espaço de escrita. No quarto do terceiro andar com janela de dormer (telhado) e duas camas de solteiro que não podem ser empurradas juntas. Casa de banho privativa com chuveiro. Muito especial e fascinante. Área agradável jardim privado sob o Torretta montado com mesa, cadeiras e cadeiras. Todos os banhos espaçosos renovados com azulejos italianos. Água quente separado para cada banho. What a wonderful introduction to Italy! Let’s just say we enjoyed ourselves so much we hope to return someday. Martha and Federica were both the best hostesses. We stayed in one of the cottages for almost a week and felt very much welcomed. Every direction we turned was another breathtaking vista. My husband was not disappointed in Fede’s advisement on routes to take on his road bike. The town of Stia, just down the hill, had very good choices in restaurants and an unspoiled, casual atmosphere everywhere we walked. Our visits to a nearby vineyard and a sheep farm were recommended to us and did not disappoint in what we learned & experienced. Just a remarkable stay, all the way around. Thank you, Martha and Fede! Top of Toscana at Castelo di Porciano! My wife and I were members of a small group who rented rooms in the castle and cottages. We stayed in the master suite on the castle’s fourth floor. The castle itself is beautifully restored, with an astonishing vista below it, toward the town of Stia. The kitchen, bathroom and bedroom were fully equipped for visitors, so we combined meals at the castle with wonderful restaurant meals in town. Marta and Fede were warm and welcoming hosts, able to explain the colourful history of the castle through the centuries, and recommend local ‘must-sees’. We highly recommend staying at Castelo di Porciano. It is truly a breathtakingly beautiful location, well worth the hour’s drive past the vineyards and olive groves from Florence! Our family trip to Italy was fantastic, but it was made all that much more remarkable, and special, because we stayed at Castello di Porciano. What a treat! 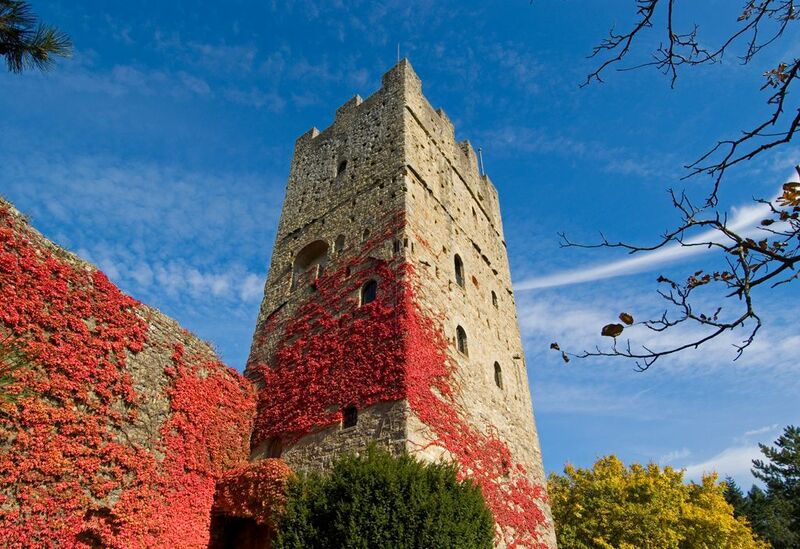 This 1000-year-old castle, artfully restored by the Sprechts, and enhanced by their daughter Martha, oozes history and shouts "I have a story to tell!" With a spectacular view of the Constantino Valley and the town of Stia, the castle dominates the slopes leading up to 5400 foot mountains. Complete with elevator and modern conveniences, the castle is comfortable, but something set apart, unlike any place we have ever visited. Air conditioning would have been welcome for several of the 90 degree days we had, but with the breeze high on the hill and large windows, the heat was never oppressive. We loved the town of Stia, so authentic and charming, just down from the castle, with its wonderful restaurants and a wine shop. The people were so very welcoming to us! We were lucky to be treated to several days of the European Biennial of the Art of the Blacksmith competition, watching blacksmiths from all over the world create beautiful iron art works in real time. Fede, was our gracious castle "hostess," made sure we were well taken care of, and didn't tire of our numerous questions. This truly was a wonderful experience which has left an indelible mark on our family, and fond memories of two weeks in an honest-to-goodness castle! Breathtakingly restored 13th century Castello all to ourselves! Unforgettable! This experience was other-worldly, and something the we will cherish forever. We've traveled in Tuscany before, but nothing has come close to this experience. Approaching Porchiano, the beauty of the Casentino valley is enough to stun you, then climbing the hill into this localita is like stepping into the ancient past, with all the charm of an ancient walled city but none of the crowds, only friendly, easy-going residents (and cats!) all looked over by the ancient stone castle – a striking and beautiful remnant from centuries ago. The castello has been lovingly restored, offering all of the creature comforts of home – a kitchen stocked well enough to host a crowd, dishwasher, stove, etc. The great room seems drawn from a fairy tale – the vaulted ceilings, arched windows, and Martha’s impressive collection of Italian antiques add a mesmerizing charm. Stepping into the four-foot thick stone wall leading to the floor-to-ceiling arched window in the great room is an experience unto itself; you will be dazzled by the view of the Porciano and Stia beyond. The first several floors encompass a fascinating museum where you can learn about the time Dante spent in exile at Porciano, the restoration of the castello, and about Martha’s family, the owners who made all of this possible. Take the lift to the top several floors and you are immersed in the charming living quarters, a collection of majestic rooms over several floors encompassing the kitchen, great room, several charming bedrooms with unparalleled views of the Casentino valley and surrounding hills, modern bathrooms, and private access to the roof of the Castello! We spent every evening sipping wine from the rooftop, mesmerized by the twinkling lights of Stia below and saying over and over, “we are the luckiest people in the world to be here!”. During the day, we spent more time on the roof spotting other castellos, like Popi and Romena, in the surrounding hills. We truly felt like noblemen of the past watching over the valley. A quick, 10-minute drive to Stia provided access to some fantastic restaurants, the mill museum, and shopping. Or, we could wander the walking paths on foot to explore other vantage points and views of Porciano and the valley beyond. Truly, the most unique and fabulous experience we have had! The property is gorgeous. The listing and photos does not do this experience justice! They are accurate but do not capture the full experience of actually living at the castle and will the guidance of our wonderful host and hostesses (Contessa Marta and Miss Fede). First of all, it was like having a virtual tour guide even before we arrived. Fede was very responsive to the numerous emails and text messages I sent. While I tried my best Italian (not much at all since I studied French), Fede and Marta were so welcoming in my native language. American...yes, American English. I was pleasantly surprised to hear the Contessa's warm and very familiar middle-American accent, which makes sense as she told me she learned from her father, a native of the American Midwest. I have taken vacations all over the world but felt most comfortable where I had friends and family, like Russia and the Philippines. My experience with Marta and Fede were exactly that...like old friends. We were even invited last minute to a wonderful dinner to celebrate a feast of the saint of the castle! I have been to many beautiful places around the world, but very few had a true experience of La Dolce Vita! This is one of them particularly because of the hostesses. And Marta is so well versed in art, history, and culture. That alone is worth the price of admission. The Porciano experience is priceless. We have stayed both in the castle itself and one of the apartments that sits right below the castle, In Appartamento Martina. Both stays were lovely-- comfortable beds and bathrooms, very well appointed. Federica is wonderful-- very helpful with check-in and any information you may need for your stay, from restaurant ideas to events going on in the valley. Highly suggest for both a couple and families with children. We plan to return yearly! Once you have experienced the loveliness that is Porciano you will never think to vacation anywhere else in Italy. O Casentino é o primeiro vale formado pelo rio Arno; uma terra de beleza natural, igrejas rurais antigas, castelos e santuários. Rodeado pela paz do Parque Nacional Casentino Floresta, você irá explorar um canto escondido e ainda não descoberto do interior da Toscana, longe do padrão e habituais rotas turísticas e destinos. Muitas cidades do monte pequenos, conhecidos por sua beleza e história, são muito próximos uns dos outros como Poppi, Bibbiena, Anghiari e muitos outros. Florença e Arezzo são apenas pouco mais de uma hora de distância. Siena e Cortona são viagens lindo dia de Porciano. Excelentes restaurantes com produtos e especialidades locais. Igrejas românicas e mosteiros abertas para visitas. Parque nacional com trilhas marcadas para todos os níveis. áreas para piquenique públicas de todo o parque. O Casentino é uma área que mantém o apelo de um Toscana menos conhecidas, onde o sentido de tradição ainda é forte. O desejo de seus habitantes de não perder a sua ligação com a história passada é sentida em todos os lugares. Venha desfrutar da, hospitalidade toscana tradicional real! Cancellation Policy: guests will receive: a full refund if they cancel at least 30 days before the start of the holiday; a 50% refund if they cancel up to 2 weeks before the start of the holiday; no refund if they cancel within 2 weeks of the start of the holiday.